It’s been 2 weeks since I wrote the last blog. There was a major blizzard that took my time to deal with. Fortunately I didn’t lose power and there was no huge troubles. 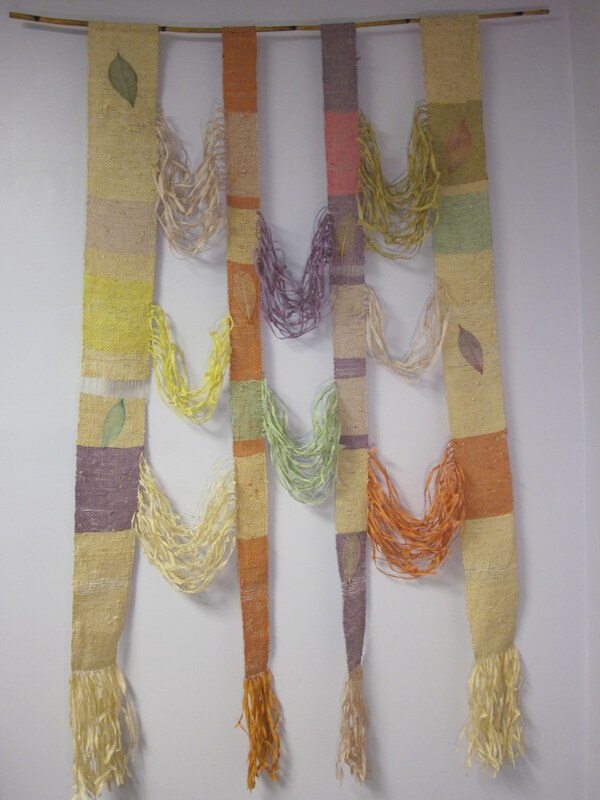 I could not update the blog last week because I had been working hard on these three tapestries below. I worked until the last minutes yesterday to complete the third one to submit a jury show. I felt so good to finish all three although the day before I was not sure if it was possible to make it. 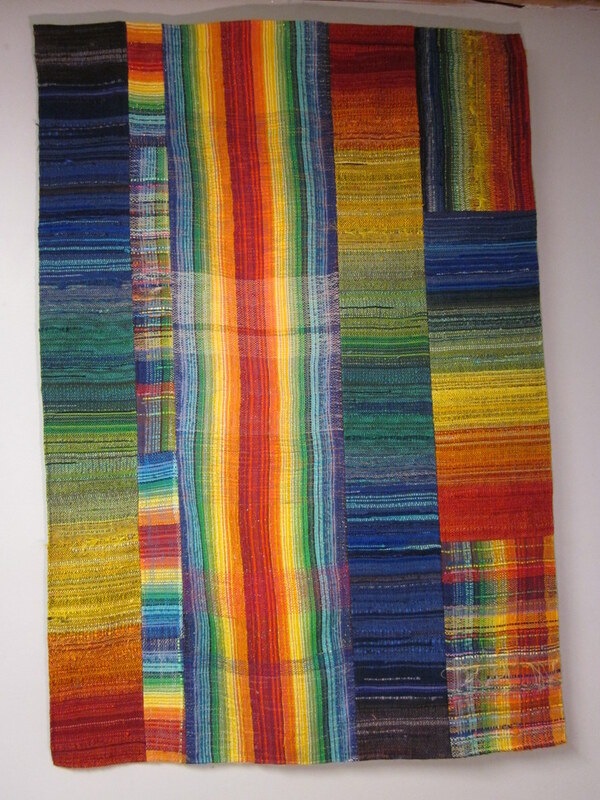 I wove several rainbow pieces and cut and paste using three banners. What I wanted to do here was reconstruction. This was woven with Japanese paper in both warp and weft. I put some leaf skeleton with glue for accents. The title is “Sun ray through trees”. I love working with paper and have woven paper in the past. I learned that when paper was woven, it didn’t appeal so much. People can not tell it’s paper. So this time I wanted to show clearly it’s paper by leaving some part being unwoven. I spent a lot of time to spin the paper to get strong enough to be warp thread. Then I spent hours to unspun the fringes at the bottom. This is “Weaving Circle”. I patched many leftover scrap pieces together first. Then I covered with black jersey fabric , sewed and cut out jersey pieces just like SAORI T-shirt technique. While I got the idea to put many scraps together I didn’t have any specific idea what shape I was forming or what kind of design I was cutting out. Just the day before of the due date I wanted to express weaving itself somehow. That’s how I got the design. And I learned to use invisible thread to patch pieces together this time. It made nicer edges to make me happy. During the whole process of making these tapestries I got many new ideas which I successfully cooperated with in the work. Some of them were saved for another project. At this point I don’t care so much if these pieces are chosen or not for the show. I know they will be shown somewhere somehow. Well, my students can see them at the studio for sure. Hopefully they inspire them in any way. Mihoko, these works are truly inspiring! The paper one really touches me, I love the way the paper drapes in between the panels. The Weaving Circle reminds me of a stained glass window. Beautiful!